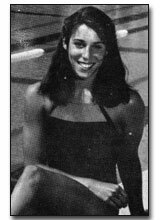 Shannon Orcutt was a member of the United States National Swim Team from 1981 to 1984, and was world ranked in the 100-Meter and 200-Meter Breaststroke during that period. In 1978, as a ten year old, Shannon’s 200-Yard Freestyle Relay Team set a new national record. The following year, she broke the Southern California 11-12 year old age group mark in the 50-Yard Breaststroke. In 1981, she set a new 13-14 years age group world 100-Yard Breaststroke record (2:15.86), a mark that still stands. Shannon's Capistrano Valley High School 200-Yard Medley Relay Team set the national high school record in 1983.